The following terms and conditions shall be part of any contract of sale, which may be entered into between the Buyer and Monon Process Equipment. Any terms and conditions in Buyer's purchase order, acknowledgment or any other writing pertaining to such order, irrespective of it's wording or of when received by Monon Process, which are in conflict or inconsistent with or add to the terms and conditions hereof, will not be accepted or become part of any resulting contract without Monon Process's express typed or handwritten consent. Neither acknowledgment or return of a copy of Buyer's purchase order or other form, irrespective of it's term, nor the filling and shipment of such order, shall constitute acceptability of such conflicting, inconsistent or additional terms, nor shall they in any way operate to modify or change the full effect of the terms and conditions herein. Unless otherwise agreed upon in writing, the following specific terms and conditions of sale apply to all sales and offers to sell Monon Process's product. All quotations are made for immediate acceptance and are subject to withdrawal, change and prior sale of disposition without notice. All proposals and acceptances of orders are made with mutual understanding that purchase orders are not subject to cancellation. Specifications are approximate, intended solely as a guide and are not binding. Unless otherwise stated, a quotation is valid only for a period of thirty days from the date of the quotation. Payment in-full is required prior to shipment via certified funds or wire transfer. Down payments are not refundable and all sales are final and not cancelable. If for any reason Monon Process Equipment agrees to accept a cancellation, a restocking charge of 25% to 50% of the sale price will be charged to the Buyer. If for any reason Monon Process Equipment agrees to accept a cancellation, refunds will be made via wire transfer, ACH, or company check. Shipping or Delivery dates are approximate only and are contingent upon payment-in-full. Monon Process Equipment will not be held liable for failure to deliver due to delays or nonperformance occasioned by strikes, suppliers' delays, accidents, fire, changes requested by Buyer or other causes beyond Monon Process's control. 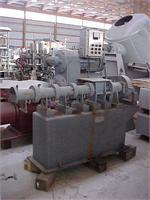 Monon Process Equipment will not be liable for loss of revenue due to delayed delivery or installation of equipment. Unless otherwise agreed in writing by Monon Process Equipment and Buyer, all crating, rigging, disassembly, assembly, freight, installation, service, insurance, and taxes are the Responsibility Of The Buyer. Unless otherwise stated in Monon Process Equipment's invoice, shipment will be F.O.B. Location of Equipment, with all risks of loss and damage passing to the Buyer upon delivery of the equipment to the common carrier. Claims for damage in transit must be made by the Buyer with the Carrier. Monon Process Equipment assumes no responsibility for damages while in transit. Buyer should inspect equipment for damage upon delivery by Carrier. Equipment is sold "AS IS", "WHERE IS", and "WITH ALL FAULTS" and subject to Seller's Terms and Conditions and with no return. Monon Process Equipment neither makes nor assumes any warranty, whether statutory, by operation of law, or otherwise, express or implied, with respect to any equipment, or with respect to the merchantability or fitness of such equipment for any purpose or any other warranties, unless Monon Process Equipment has so provided in writing. Monon Process Equipment does not warrant that such equipment conforms with any plans, regulations or ordinances pertaining to safety or insurance requirements, and there is no obligation of Monon Process Equipment as to conformity of the equipment. Buyer acknowledges that it will be responsible for ensuring that all equipment purchased from Monon Process Equipment is installed and operated in a proper and safe manner. Buyer also acknowledges that it may need to install or change guards, safeties, warnings or other components to ensure that the equipment will conform to all laws, regulations, ordinances, codes, insurance requirements and industry standards. Buyer agrees to defend, indemnify and hold harmless Monon Process Equipment from and against any and all suits, claims or liabilities for personal injury, death or property damage arising out of or resulting from accidents involving use of this equipment caused by failure of Buyer, his employees, or recommendations available from the original manufacturer, or by failure of Buyer to comply with Federal, State And Local Laws applicable to such equipment including the Occupational Safety And Health Act of 1970. It is understood that there are no conditions or agreements outside of this written proposal and that all prior conversations, agreements or representations with reference to the subject matter are superseded. No change of this agreement shall be binding without the written consent of all parties. Buyer agrees that any legal actions arising from this transaction will be governed solely by and construed in accordance with the laws of White County in the State of Indiana. In the event Buyer takes legal steps to enforce the terms of this transaction or the termination thereof, the Buyer agrees to pay all costs related to such action including any legal fees and disbursements.